With Liz gone and their most powerful enemies banding together for a final, catastrophic attack, Abe, Kate, and Johann must determine the price of their souls as they decide where their loyalties lie,and whether the life of a friend is more valuable than the fate of the world.B.P.R.D. 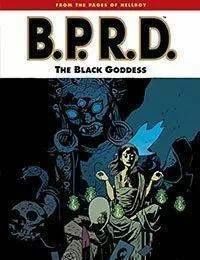 : The Black Goddess collects the second arc of the Scorched Earth trilogy, pulling together threads from the beginning of the series, with a twist that will shake the worlds of B.P.R.D. agents and readers alike.Collects B.P.R.D. : The Black Goddess issues #1-#5.